Now the ModScript supports checkboxes and radiobuttons. It allows to select which features of the mod will be installed. Mods are not now installed automatically but only after clicking on the Install button. Hello i wanna ask what is the progress of globalED. Great Work, realy good too see new updates! So is it possible to add new car to game datebase with this version, without replacing anything? If not will it be possible in future versions, or it can't be done at all? Today I tried to add another Fiat Punto. After that there were 2 Puntos in the showroom,but the game couldn't load my saves. Maybe I did something wrong,but if you wanna try it you should have a non-modded version. Will there ever at any point in time be the possibility to add stand alone cars to the game without replacing one? @nfsu360 is it possible to add brand new cars with VLTed or do we need something else to make it? I'm still trying to copy an existing car but then the game doesn't load my savegames. So pleace tell me if I have to download other tools or I can do it already. Hello, first of all, thank you for that update, it makes modding much easier. I just found a little bug while modding NFS World, whenever you add a node or edit node fields to add more, the "daynight" cycle messes up and gets stuck in sunset. I know the bug is somewhere inside "attributes.bin". is it possible to rip Rockport City? I think I've found a bug in NFSMW. After I increase torque of some cars (Lancer Evo VIII,Punto,etc.) while driving them cops don''t pursuit me. They just find me somewhere and don't move anymore even when I'm stopping. Well,what works wrong? The game or VltEd? How to fix this? Could you send .nfsms script which can be used to recreate issue? Here it is for Lancer EVO VIII. I noticed that only some of cars have this issue (I haven't checked them all to tell you exactly). when i save,it says that an error has occurred.Why? What's about consoles textures export tool? Like for PS2 Demos. 911 GT2 with bodykits, but replace 911 Carrera S. How can I port car mod from MW Mod Loader to VLT and second, can I adjust modded 911 GT2 so it will now replace original 911 GT2? 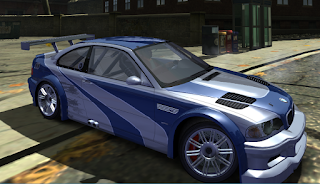 car mod M3 E46(road version) and adjust it so it will have performance parts and all visual modifications. As I've heard you can replace only those cars that the mods were made for. So you can't put your new 911 instead of any car besides 911 Carrera. the model itself needs to have a changed xname,I could create a 911 GT2 Model fix soon. for when the download ?????????????? It is already ready for download. If it doesn't include Ug2 as a potentially editable game , that obviously means that it won't open it. NFSUG2 is kinda old and doesn't have a vlt architecture afaik. Its because NFSUG2 used a different game engine/database collection type, that NFS-VLTed cannot open.For PS2 EAGL 3 games VLTEd 1.1 works(that was extra info but if u want it.). 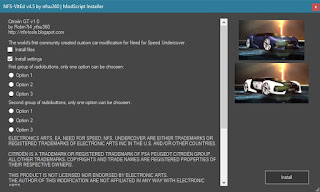 Is there any tool to edit/extract NFS Undercover language files (.bin)? I want update the translation to Portuguese-BR. Did you use older version of NFS-VltEd? 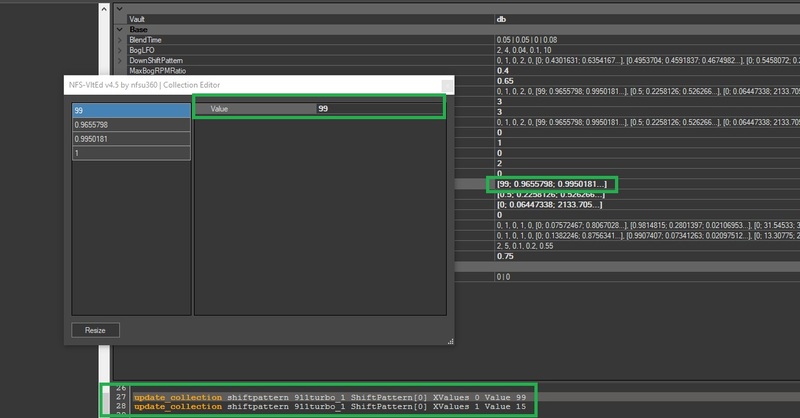 Can you upload your files: ATTRIBUTES.bin, FE_ATTRIB.bin, gameplay.bin and cars_vault.bin? How to fix "An error occurred while saving. The changes cloud not be saved."? Have you tried to run nfs-vlted as administrator? Hey there I'm having a problem with this tool that is really bothering me. In my NFS carbon game, I have a mod called "M3 GTR TURBO CARBON v 2", This mod basically makes the M3 GTR faster by adding a modified version of the GlobalMemoryFile.bim file. Latter, when I tried to use this tool to manually modify the sound of the M3, to make it sound like it did in NFSMW, this tool automatically resets all of the previously modified stats of the M3 back to the vanilla stats, leaving only the sound modifications intact. How do I prevent this tool to override my previously installed mods back to normal ? (p.e pursuitlevels -> heat05 -> cops) has a lenght (Capacity) of 3 and a used length (Count) of 2. 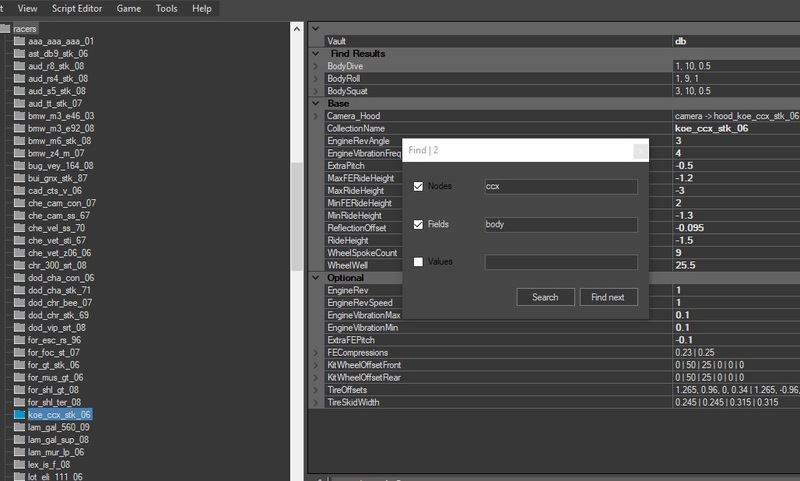 I can change the used lenght with the field editor, but is there a way to change the length? The question is, If i can insert a new entry in the table. I can't open GlobalMemory.bin file of NFS Pro Street (v1.1) with this version of the tool, it doesn't let mi collapse the GLOBAL folder when I search it after selecting File/Open. I can only open it with the version 1.1 of the tool. Do you know why this happens or what do I do in this case? I'm new in this of modding. This is an amazing tool, I apreciate so much your work. probably corrupted files. Did you use older version of NFS-VltEd? Any further version can't. Although I don't have the original NFS ProStreet. Is the R.G. Mechanics' one. It might be that. I love this awesome masterpiece! 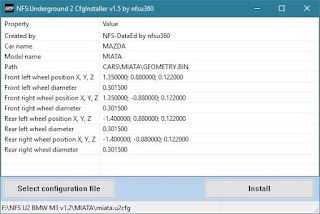 Besides, is it possible for you to make it support NFSU2 too in the next version? Hello, i realized download, but when i go extract, the archive have erros, and i dont can extract. Can help me???? Very good program right here. easy to find many values now and .nfsms makes it easier than ever to share, thanks nfsu360! Anyone knows how to use radiobuttons and checkboxes? i cant find documentation for this. I've recently encountered a problem with your Vlt-Ed tool. 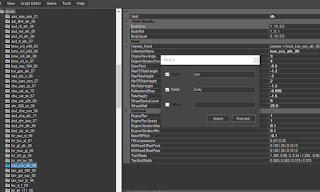 Normally, I was able to open Most Wanted and Carbon with the tool and edit some values. Now, the Vlt-Ed doesn't accept Carbon. It says the following - "The folder you selected: D:\Games\Games\Need for Speed - Carbon, doesn't contain the supported version of the Need for Speed game. Most Wanted works fine but Carbon v1.4 doesn't. Please help. Also, I didn't use any older version of Vlt-Ed to modify the game files. I have even encountered a problem where pressing the Handbrake button randomly causes the car to teleport into another area (Palmont University) and if I use the Handbrake in Canyon Races or Drift Races, the car instantly teleports into the black void. i cant install nfs carbon modscript with vlted 4.5 .. donno the reason. carbon is on 1.4 and I got always error messages. if anyone has a fix or suggstion dont hold your horses and pls help !! which directory should this file be in? I reinstalled the game some minutes ago and still nothing works... just an update from yesterday. is it possible to upload your crucial folders or files to mediafire? and should i patch the game again or not? don't worry about cars_vault.bin. There is no such file in Carbon. Anyway, the tool loads your files without errors. I think it may be a permissions problem, so try to run the tool as an administrator or install the game on a different partition. may be a sily question but, can send me a torrent link where you downloaded the game? and another question, is there any requirements for this app to work? i set "run as adminstrator" nothing changed..
set the compatibility to xp ; 7 and vista,,, again nothing worked,..
Hey when i edit my values and do what ever with the Tool, i press save and it gives me an error saying it cannot be saved, any ideas? I cant run it, when i extract it and i want to open it it says me it cant run because its not an Win32 application. do you have .NET Framework 4.5 installed? So, i want to import an NFSCfg but it says that the configuration is corrupted or not a supported format even though it's not. Any help or solution? Whenever I try to use it there is an error saving it, what should i do?? does modloader work after using VLTedit? Mine doesn't seem to work. Help!!! Windows Troubleshooting Computer troubleshooting Windows aspect is in some ways additional art than science; it's additional of a wedding between your basic pc understanding and every one the peculiarities of your specific system. This series can facilitate get you pointed within the right direction in order that you have got a higher plan of the troubleshooting resources that ar at your fingertips. Hello, how would I be able to edit the car's performance? I tried to open nfs carbon but it says This version of Need For Speed is not supported. The game version is v1.4. Can you help me pls? Hello! thanks for the awesome tool! but when i wanted to install a nfs world online version (soapbox) mod called original bmw m3 gtr sound mod but when i try to open nfs world in nfsvlted it doesn't recognize it i asked one of the devs he said search it up and there is no luck would be grateful if you did! I've created the sound mod. You can see it on my channel. Unfortunately it seems that VLT-Ed doesn't recognize the game even if the right path is set ( You have to select the folder named " Data " and not the " Need For Speed World " one. I found a bypass but you need to have the bêta version of the game (any of them can do the trick) , you'll have to open it , and right after open the folder where the final version of World is set. That's the only way I've found to edit World's database, and I don't know why it happens. Make sure that the executable of the game is the original one. Does anybony know ed how to change chase probability in MW boss races? When I try to save Carbon with an NFSMS file imported, it says that an error occurred while saving. Hey Dude! So I just downloaded some car mode for NFS Pro Street but the Nfs-Vlted 4.5 keeps saying that my selected game folder doesn´t support it. I have downlaoded Pro Street from Kickasstorrentz, could that be the problem? what exactly mod do you want to install? Can you send a packed GLOBAL folder from the game? Hey bro! Whenever I use VltEd 4.5 to install the tire sound modscript, it messes up the globalmemoryfile.bin and the wheels of all the modded cars I've installed are messed up. And whenever I put back my backup copy of the globalmemoryfile.bin the tire sound mod is gone. Is it only one or the other? Is there no way to install the tire sound mod without messing with the global memory file? Thanks! Hi nfsu360 I'm having a problem with vlted. when I install a mod at carbon, prostreet etc... when I go back to the game the car won't load. it stays invisible. what am I doing wrong, I mean first I install the geometry and textures (everything as administrator) later I go to vlted and install the nsfms later I press save and then run the game. but the car just won't load not even the original car it just stays blank. why? any updates to this version? hope this issue was reported. this issue will be fixed. Updated version will be available soon (up to one week). I don't know why but my vlted has been showing up an error message and the values are black rectangles! 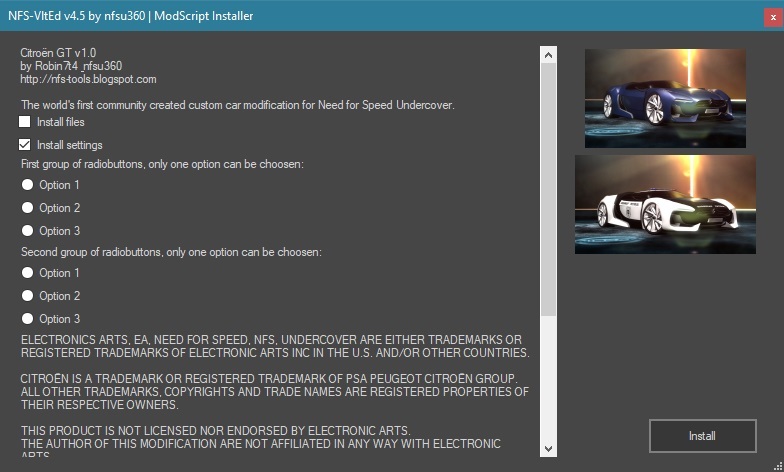 NFS:Underground 2 ModTools 1.2NFS:Underground 2 BMW M3 1.2 NFS-CfgInstaller has been removed and replaced with a new tool: NFS: Underground 2 CfgInstaller. The tool has user friendly interface and supports .u2cfg and .u2car files. Old NFS-CfgInstaller tool was detected as infected. It was a false positive detection(it's a very common problem in the antivirus industry). Vinyls have been ported from the Xbox 360 version. The mod applies to all cars.